The ProducTVity Station™ (PTV) (905-5719) from Red Lion is a ready-to-deploy solution for the collection, recording and display of crucial key performance indicators (KPIs) and machine/equipment status messages to any TV, projector or monitor that’s equipped with a DVI/HDMI interface. The ProducTVity Station can gather information from a large range of automation components. Employing a library of over three hundred communications drivers, the ProducTVity Station will communicate to PLCs, motor drives, barcode scanners, motion controllers and many more. In addition, the PTV can be extended with CS series I/O modules, permitting it to accept digital as well as analogue inputs from a variety of sensors. A fully-programmable, simple to use graphical interface means users can build high-definition visual management displays quickly and easily – without the boundaries imposed by more traditional LED-based Lean manufacturing displays – visually combining KPIs together with andon messages. The ProducTVity Station’s 720p (1280 x 780 resolution) DVI output is compatible with 720p and 1080p/i TVs with DVI or HDMI interfaces. An intrinsic data-logger can record key performance indicators, likewise andon events, for later review, and the log files can be synchronized with any FTP server and/or Microsoft’s SQL Server® for detailed analysis. The ProducTVity Station extends the visibility of production monitoring to remote personnel by providing email and text alerts, and its intrinsic web server permits productivity information to be monitored via any networked PC, device or smart-phone. If enabled, personnel can take partial or full management of the system remotely, allowing a maintenance person to make changes without requiring a visit. The ProducTVity Station comes complete with a 2GB CompactFlash card, a DVI to HDMI cable (15´), and HDMI/DVI adapter. 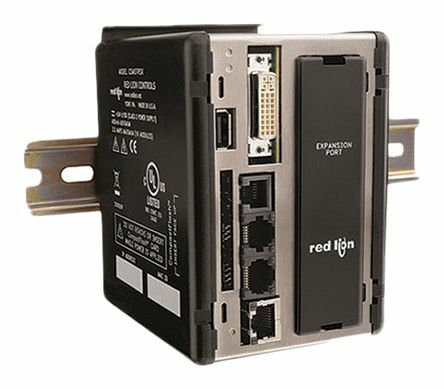 The device is programmed with Red Lion’s Crimson® software package. For additional information on the PTV, please contact Sophie Kayani at Red Lion on 07591 206854 or Sophie.Kayani@redlion.net.